Thank you so much for your donations to my project. Thanks to Disney we have a 30 gallon saltwater aquarium in our fourth grade classroom. However it requires a lot of maintenance and additional supplies. As you may imagine teaching does not usually afford such luxuries! Thanks to you my students and I will be able to continue to compare marine environments to fresh water ecosystems. The excitement of the students is tangible. Anyone who walks into our class gets a tour and explanation about the creatures in out tank and how they differ from those in our state. Thank you again for allowing me to provide this wonderful opportunity for my students! Thank you for your generous donation to my class. 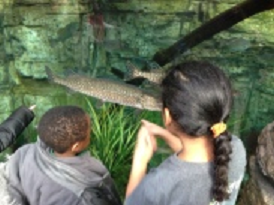 My students, as well as two other classes, were able to enjoy an experience of a lifetime by going to the aquarium. Many of my students will live their lives without ever stepping foot in the ocean. On our trip, students were able to have hands-on experiences with this part of our world. We saw sharks, turtles, eels, jelly fish, and so many other types of animals. We even got to touch and feed some sting rays! You have truly made a difference. Thank you for giving my kids this opportunity. I hope this has inspired them to see the world a little differently. I want to thank all of you for funding my project for plankton nets. We used the nets on a recent trip to Wrigley Institute for Environmental Studies on Catalina Island. In addition to a wonderful day packed with lots of new experiences for many of my students, we had an opportunity to survey life on the island an in the kelp forest just off shore. 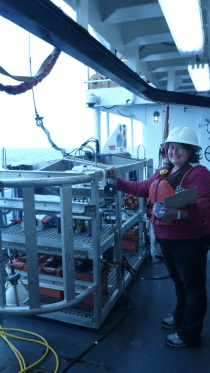 The plankton nets were a perfect addition to understanding food webs in the ocean and understanding that a single drop of ocean water is much more than just hydrogen and oxygen molecules. Thank you for this wonderful experience. The pictures and thank you cards are not enough to truly understand the huge impact this trip and this experience had on my students. We are all still talking about it! Thanks. We cannot thank you enough for making the dream of visiting The Cabrillo Marine Aquarium a reality. On a cool Southern California day the school bus drove us 30 minutes to San Pedro. With all of the recent cut backs, we had the facilities to ourselves. Our two classes were divided into 6 groups of 10 students each. 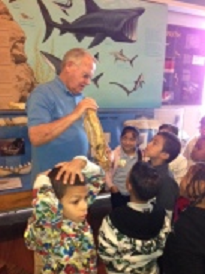 This allowed each and every student the chance to view, touch and observe the sea life in the tanks and the tide pool. The classes also enjoyed eating on the picnic benches along the shore. Following lunch, we walked along the breakwater to look for dolphins. NO dolphins were spotted but we enjoyed seeing a flock of pelicans floating in the calm waters along the coast. Thank you for your generous donation to my classroom and students. 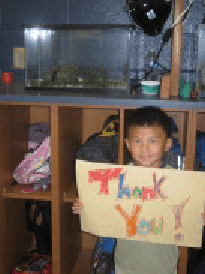 The fish tank, marine conversion kit, and marine animals that you funded have brought so much joy and life to our classroom! My students have been able to observe and explore marine animals in their habitat over the past several weeks. They have been able to make observations that many would have never been able to make in life without the benefit of a marine habitat in our classroom. There is a major crisis in education right now. Educators and administrators are feeling the impact of cuts in all areas, especially in the area of science. It is through the help of wonderful people like you, that teachers are still able to give students the life changing experiences that will follow them in life. Thank you for everything that you have done to help my classroom and students! This is just a small token of my appreciation for your generosity in assisting in providing materials for our library. 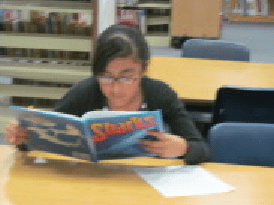 The shark books that you donated have helped my students ever day. The students have checked them out continually and they are rotating in and out nonstop. The students have been able to use them for research projects in the classrooms, for leisure reading as well as finding text structures with literature that students are interested in reading about. These books are used by the entire school of over 600 students. What a great asset to our library! With our school continually facing budget shortfalls and decreasing funding your help has put many smiles on the faces of our students. The excitement and reaction of seeing the students with new books in their hands is indescribable. While these books will continue to nurture our students through the nonfiction text on sharks and sea life, they will also enjoy seeing and handling fresh new books from the library. Without donors like you, projects like “Shark Attack” would never be funded and students would continue to do without the great materials that are available. Thank you so much for your generosity. Thank you so much for your generous donation to our science classroom. The arrival and set up of the salt water aquarium have been tremendous learning experiences for the students. They continue to learn and explore the species each day. 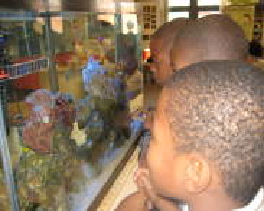 We are learning about their feeding habits and observe the interactions within the aquarium. We are enjoying caring for the aquarium and look forward to adding additional species in the future. Without your support through Donor’s Choose this project would not have been possible for our classroom. Thank you for your support of science education and hands on learning. Doesn’t Everyone Want to be a Marine Biologist? 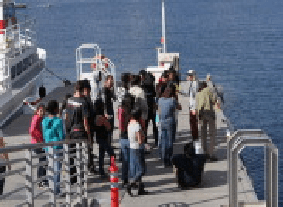 The equipment that was purchased with your donation was used in the second rotation of the Marine Science enrichment class held during the advisory period. Students really enjoyed using the 10x magnifiers to get great details from the specimens. Their journal sketches were amazing and they asked many questions based on their observations. I copied some of the drawings for display in the hallway gallery and those not enrolled in the class began asking what the drawings were and how to get enrolled in the next rotation. 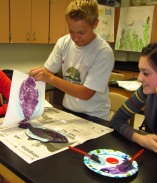 On the final day of the mini-course, we used the rubber casts of the fish to make fish prints. I had students print on paper for themselves and on cloth so that we can make a banner to display in the office. The rubber molds allowed me to provide each lab station with a specimen and we, here in the desert, appreciated the availability of life models of animals for which we had no ocean access. Thank you for investing in these kids. One girl has told me she received scuba lessons for Christmas since her interest was so high and several students have requested enrollment in the next rotation this month! This project is awesome. The jellyfish might just be the coolest class pet ever!!!! They are beautiful creatures that most people don’t get to witness up close on a day to day basis. My students absolutely love them. My students have been doing a lot of research on ocean ecosystems. It is a very interesting topic that students are always interested in. Along with researching ocean ecosystems, we have also been researching pollution, specifically ocean pollution. The ocean trash can kit enabled us to pollute our own makeshift oceans. We learned about the 5 different pollutants that go into the ocean and how they effect the different aspects of an ocean. I think they liked the part where they got to create an oil spill. Don’t worry, they did a great job cleaning up the synthetic feathers and fur that were covered in oil. YUCK! This was definitely a wonderful hands-on project that really educated my students about ocean pollution. Thanks again for your amazing generosity! Thank you all for your generous donations to my Ocean Literacy project. These materials will enable my 30 inner-city students to begin their ocean research, and to become advocates for the protection our Earth’s ocean habitats. Your generosity supports education, ocean literacy, and environmental protection, but by funding my project your donation really does much more. By supporting this project on Donor’s Choose, you connect to students who are often isolated and struggling. Your donations add value to the work I do in the classroom every day. Also, this “kindness of strangers” will help my students understand and recognize the role we all play in building a world where people work together to help one another. Your support enlightens students through the materials you have provided. It also encourages, inspires, and lays the foundation for good citizenship in the future. I am very grateful. Yay! These are the next wave of world changers. Get it!